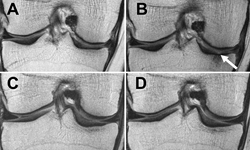 Overweight and obese people who lost a substantial amount of weight over a 48-month period showed significantly lower degeneration of their knee cartilage, according to a new study published online, May 2, in the journal Radiology. The most exciting finding of our research was that not only did we see slower degeneration in the articular cartilage, we saw that the menisci degenerated a lot slower in overweight and obese individuals who lost more than 5 percent of their body weight. “Is Weight Loss Associated with Less Progression of Changes in Knee Articular Cartilage among Obese and Overweight Patients as Assessed with MR Imaging over 48 Months? Data from the Osteoarthritis Initiative.” Collaborating with Dr. Gersing were Benedikt J. Schwaiger, M.D., Michael C. Nevitt, M.D., Gabby B. Joseph, Ph.D., Nattagan Chanchek, M.D., Julio B. Guimaraes, M.D., John Mbapte Wamba, M.D., Luca Facchetti, M.D., Charles E. McCulloch, Ph.D., and Thomas M. Link, M.D., Ph.D.